I am Ajay Ghale, the son of the legendary revolutionary Mohan Ghale, and I’m on the receiving end of a lecture about morality. Sabal, one of the leaders of the freedom-fighting Golden Path, expounds on the value of tradition and the need for the people of the (fictional) Himalayan country of Kyrat to return to their honorable cultural roots. He slams a door in my face, and a moment later, the word SKILLS is emblazoned across the side of the screen, stamped in bright yellow. The UI rushes to catch up: I have new side missions available! I have another 130 Propaganda Posters to remove! I should hurry to the monastery! This is Far Cry 4. As Ajay Ghale, I’m expected to drive, shoot and fly through Kyrat in order to help the Golden Path take the nation back from the tyrant Pagan Min. It’s up to me to capture important strategic assets, to save cultural artifacts, and to be the voice that decides the overall philosophy of the resistance. But if my “Progress” screen is to be believed, I’m also expected to do a bunch of other, well, stuff. 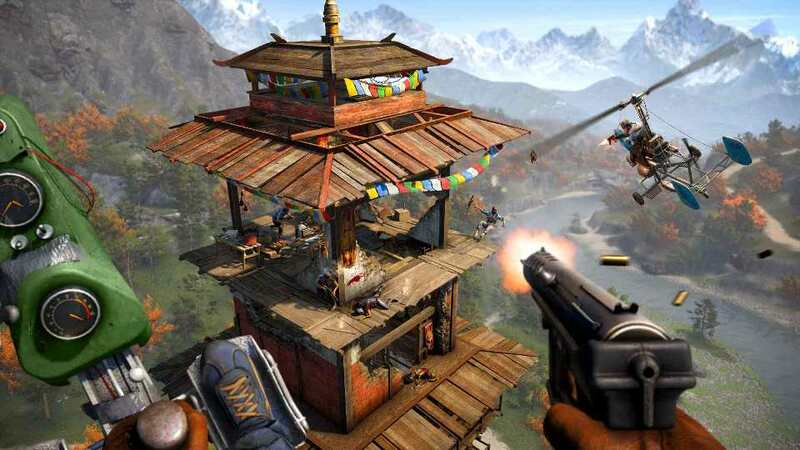 Far Cry 4 has more busy work to do than any other game in the series: Four side mission campaigns—many of which repeat basic mission structure. Twelve sorts of side “activity” (including four distinct styles of hunting mission.) Six kinds of collectibles, totaling 285 things to pick up. It’s an Ubisoft game, so yes, there are towers to climb. Not only can you capture outposts (24 of them! ), as in Far Cry 3, but now you can go after four special “fortresses” as well. Build your Karma meter through special “karma events,” and make sure to complete your location guide! Not enough for you? Well guess what, with the new Far Cry 4 map editor and browser, you can build, share and play new content! There’s more, believe it or not, but I can’t bring myself to go on: It’s just all so exhausting. One of the major complaints about Far Cry 3 was that after players conquered the enemy outposts, the world felt dead and empty. This sprawling web of side content feels like an answer to that critique, but if it is, then it misses the mark. Kyrat doesn’t feel alive so much as it feels noisy, a cacophonous howl of possibilities. As much as any gun fight, this huge list of icons and checklists is violent—it takes the organic world this team built and cuts it up into little morsels of content. And then it buries you alive in the morsels. Ironically, Far Cry 4 is at its best not when it’s offering lots of options, but when it gently takes the reins away through some of its new mechanics. The new grappling hook conveys a sense of speed and danger, but it’s surprisingly easy to swing from one grapple point to another. Need to drive across Kyrat while fending off the Royal Guard’s platoon of ATVs? The new “autodrive” mechanic will handle the steering so that you can focus on blasting fools. In fact, the game will even draw your aim to nearby enemies: all you have to do is pull the trigger. Best of all, these mechanics link nicely into the interesting systemic interaction that’s always made Far Cry appealing. Just as you’ve settled into a rhythm with your sawed off, your jeep is slammed by a rhino. A gun fight breaks out below as you swing across a chasm towards the ancient ruins. After decades of trying to get it right, this is the closest a game’s gotten to the predictable dynamism of 80s action films or your favorite roller coaster. However sure you are of the outcome, the game still manages to evoke a sense of velocity and violence. These aspirations don’t exist in a vacuum, either. 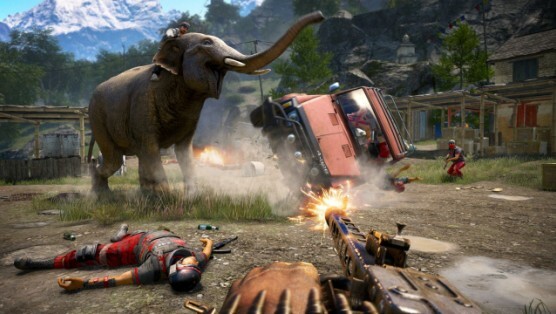 In a very real way, Far Cry 4 aims to rehabilitate the franchise. A handful of critics lambasted Far Cry 3 for its many narrative and political missteps. Cast as obnoxious thrill seeker Jason Brody, the player met a cast of “exotic” locals (all either helpless or manipulative), came under the sway of their ancient mystical powers, and eventually—please, pardon the expression—“went native.” Whatever artistic goals that Far Cry 3’s writers had for issuing meta-critique fell flat, and what was left was a mess of offensive stereotypes and boring genre tropes. It’s clear to see how this influenced Far Cry 4’s team. Unlike its predecessor, Far Cry 4 isn’t seen through the lens of a rich white dude on a wild vacation, but through Ajay Ghale, a returning citizen of Kyrat with personal and cultural investment in how things shake out. Even Ajay’s name illustrates that the game’s writers are interested in engaging in questions of race and culture, as different characters pronounce it in form either American (A.J. Gale) or Kyrati (Ah-Jay Gah-lay). Ajay is not alone. Kyrat is filled with men and women of color, with diverse characterizations and interests. Many of them take up arms to defend their homes, and unlike the villagers of Far Cry 3, I never get the impression that they desperately need Ajay to get things done. He’s definitely a heroic figure, but things are in motion before he arrives. He’s a big player, but just one of many, each of whom is important to the outcome of Kyrat. Chief among those players are Sabal and Amita, the rival co-leaders of the revolutionary Golden Path. Throughout the course of the game, the player is asked to pick sides as the two bicker over the future of the group and the nation. Sabal is a traditionalist—he dreams of the day that Kyrat can return to its glory days. Amita wants progress—she’s inspired women to step into more active roles across Kyrat. Sabal wants to protect the old statues, even though they represent a misogynistic heritage. Amita wants to build schools and hospitals, even if the funding comes through international drug trade. Their arc is uncomfortable in a way few games are. It preys on the easy liberalism that so often crops up when we talk about distant places. But this productive discomfort is undercut often and from many sides. While Amita and Sabal are interesting (if not perfect) characters, many of the other characters lack their depth. Ajay himself is, sadly, little more than a cipher with an interesting family tree. The Bible-thumping, African arms dealer Longinus is never as effective an orator as the game seems to think he is. Quite frankly, the same can be said for Pagan Min, the game’s primary antagonist, who delivers empty words with such vim and vigor that you might mistake them for having real meaning. While many of the game’s characters are native to Kyrat, it does have a collection of foreigners, and these too feel like a response to the mistakes of Far Cry 3. Like the player character of that game, these NPCs are thrill seekers, buffoons and appropriators. A pair of British backpackers mumble Kyrati religious mantras and drag you into drugged out rock’n’roll psychedelia. A doofy American needs Ajay’s help to “recover” ancient relics so he can “appease the monkey God.” While the writers may have had some sort of noble purpose for these folks in mind, they just don’t meet the mark. Like South Park’s Eric Cartman, they’re written not as teaching tools, but as comic relief. I’m certain there are already sixteen year olds quoting them and laughing along. 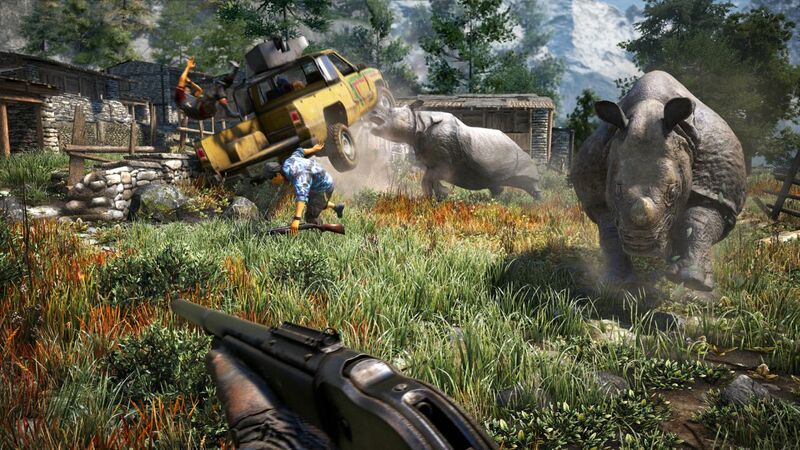 What to make of Far Cry 4, then? How to understand this disjointed thing? One of the central, recurring messages of the game is that a split operation will be held back by internal contradictions. The same could be said for Far Cry 4. This is a game that wants me to take seriously the question of revolution, and then has a major character deliver the line “Let that truck you destroyed be the first step to a new age of Kyrat.” Really? Huh. This is a game not only with a fictional South Asian religion clearly inspired by the diverse faiths of the region (and needing greater space and expertise than I have to engage with fully), but also with vulgar and boring “karma points.” Not only is it a game with karma points, it’s a game with a mission where you fill a karma bar by lighting candles and burning incense. In the year of “Press F to pay respects” and “Press X to kiss your wife”, one has to wonder if AAA has learned all the wrong lessons from the rise of “empathy games” in 2013. When spiritual and emotional growth have to be codified in bland progression systems, it betrays a lack of confidence in the game’s story telling. So, like an animal that smells fear, I lose confidence in the game, too. Suddenly I feel awkward about the whole idea of this sort of digital tourism. And now I’m wondering, “What should we make of Far Cry as a series on whole?” They’re disparate games, but it strikes me that there are two major through lines for the series. First, through the implementation of in-world UI, player character animations, and detailed, first-person driving, these games (to greater and lesser degrees) make the player feel embodied in their character in a way that few other first-person shooters manage. Second, Far Cry has always presented large, distant, colorful spaces to explore and strategically exploit. From the most recent game’s Kyrat, to Far Cry 3’s fictional group of Pacific Islands, to the “Unnamed African Country” of Far Cry 2. And, of course, the original Far Cry filled a mysterious South Pacific archipelago with strange and alien “Trigen” mutants. You may have heard by now that there is an “alternate” ending to Far Cry 4 which is accessible at the very start of the game. You receive it by being passive, by waiting around when the bad guy tells you to wait around. After 15 minutes or so, he’ll show up and take you to your final objective, where you have the same moment that you would have after 20 or so hours of play. In its natural place at the end of the game this moment feels lackluster. But here, re-contextualized to the beginning of the game, it is touching, confident, and new. You are rewarded for patience, not gunplay or persistence in finding collectibles. There are no blaring UI elements, no deafening screams of boxes being checked off. It is, unlike the rest of the game, quiet.